There’s just something about the combination of strawberries and bananas. When I was a little girl and feeling sick, my mom would make me warm jello water with the strawberry banana flavor and I swear it had healing properties, lol. 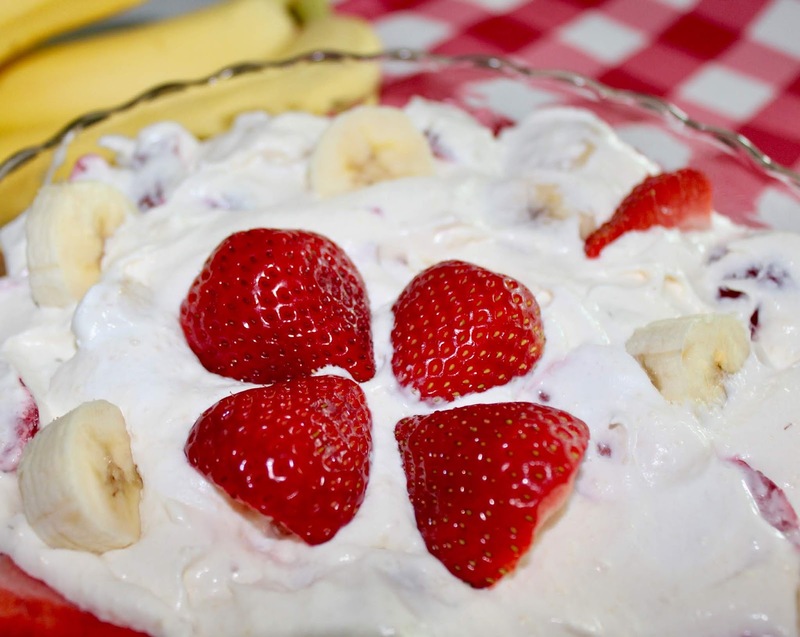 For Mother’s Day, I made my mom the creamy Orange Fluff and thought what other kind of creamy fruit salad can I concoct? I had some very nice strawberries and while strawberry season here is another few weeks away, the Driscoll brand is always very nice and flavorful. This recipe has no jello in it but it does have Jell-O brand Cheesecake pudding flavor and it is delicious!! I put bowls of this in my summer working boy’s lunches and they loved it. Mr. Nine and I teased that this was another creation we could grab spoons and eat right from the bowl! 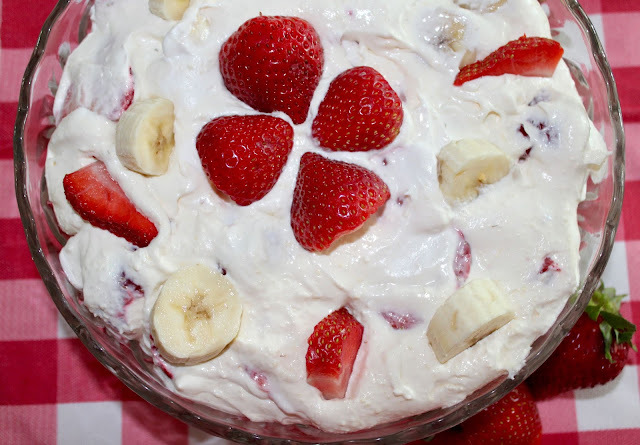 In a medium bowl, using an electric mixer, whip cream cheese until it becomes smooth. Add dry pudding mix. Beat until well combined. With mixer running slowly add creamer to the cream cheese mix. Add it about a tablespoon at a time and then mix until it becomes a smooth mixture and all of the creamer has combined into the cream cheese. Continue until all of the creamer has been added to the cream cheese. Whip until smooth. In a large bowl, combine sliced strawberries, banana slices and lemon juice. Stir until all the fruit is coated with lemon juice. Add cheesecake mixture to fruit. Gently fold cheesecake mixture into fruit. Chill until ready to serve or serve immediately. Nom nom nom but I need mine without bananas, sis! I love strawberries! 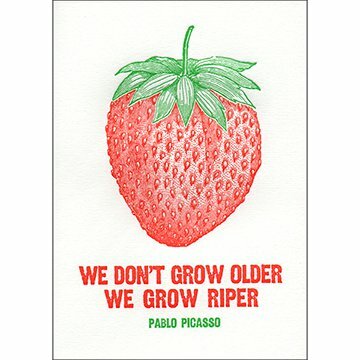 And, I can't wait until strawberry picking season. I love how you put the word salad in there LOL. This looks amazing! This looks dangerous, there's no way I could stop myself once I started!!! I love how creative you are my talented friend, another yummy creation! Yum! I could eat this right out of the bowl too. What a smart new recipe! Pass the spoon please! Any type of cheesecake salad winds up being something I'm likely to sit down with the whole bowl & a spoon. Blueberry cheesecake salad is my favorite. Positively, absolutely, definitely going to make this!! This is combining SO many of my fave things- I need to make this, ASAP! Cheese Cake and Salad should never be used in the same sentence. However, this is a must try for me!!! 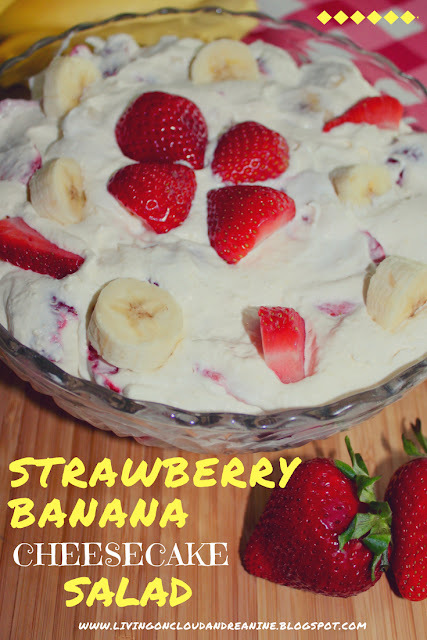 Holy Cow this sounds good, I love strawberry and banana together and add in Cheesecake and it is just heaven! What a great summer dessert! This looks like a delicious summer treat! 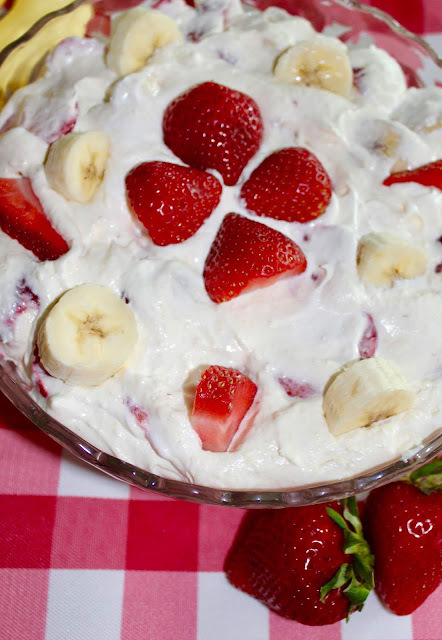 I love lighter, lower cal desserts especially in the summer and this is a great option! Thanks for sharing! Well, I don't care for banana's but bet I could make this with banana's only and it would still be very good. Might have to try it. You definitely cannot go wrong with any of the ingredients in this dessert. It's calling my name right now! Looks divine! I just saved this to my recipe collection. Oh my gosh, it sounds amazing! This is the kind of salad I can get behind!!! This looks sooo yummy!!! Thanks for sharing this drool-worthy sweet salad! 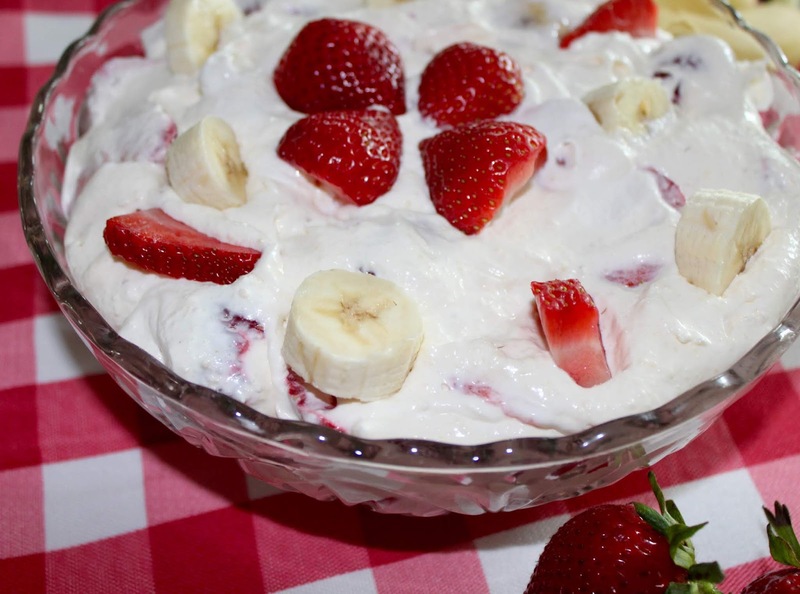 Strawberries and bananas - what could be better than that!?! Oh yes, add in some cream cheese!!! This cheesecake sound scrumptious. Thank you for sharing at Sugar and Spice link party. Anything with cream cheese and Cool Whip is a winner in my book. And when you add the rest of the ingredients whoo who! What a delicious salad that is perfect for summer! Hope you are having a great weekend and thanks so much for sharing with us at Full Plate Thursday! How many does this serve? Would I need to make two batches to serve at an 8 girl bridge group?! Looks so yummy! You had me at cheesecake. When you say coffee creamer, do you mean the liquid kind or dry kind ? Pass a spoon to us too ! Wouldn't this look beautiful on a springtime buffet? Thanks so much for sharing with Party in Your PJs! This dessert looks scrumptious!!! Shared to G+ for you! Would put on my Pinterest Yummy! board but I guess you don't have that ability. 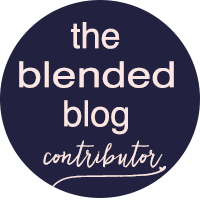 Your post is featured in our Top Ten this week on Full Plate Thursday. Thanks so much for sharing this awesome recipe with us! Oh my! Doesn't that look good!